A while back ago I shared a video for how to embroider French Knots and there was a very specific reason for it. Many years back I had gotten really, really into jewelry making and I’ve got tons and tons of jewelry making “stuff” for the day I get back into it. And I will because I totally go through craft phases and they are totally cyclical. 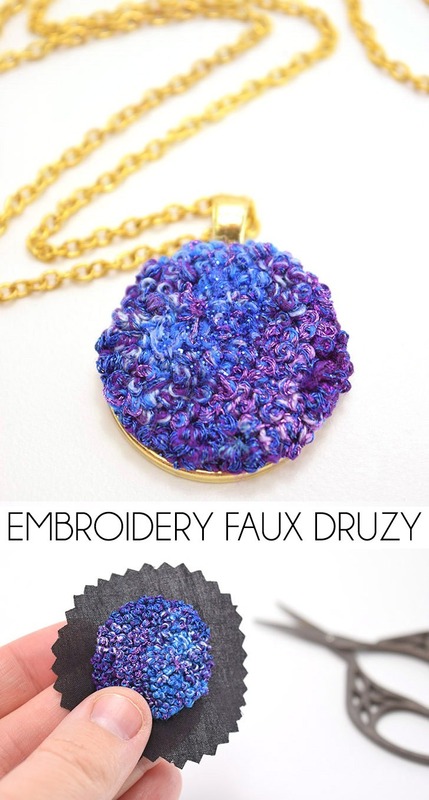 And back in the day I wrote in a notebook “faux druzy pendant French knots”. Just the other day I was out in the garage hauling stuff around trying to make a dent in business because it won’t be too terribly long before I need to get out in that garage and start stripping the black paint off of my black dresser. Right now, there is NO room for it because it is crazy out there. CRAZY I tell you. 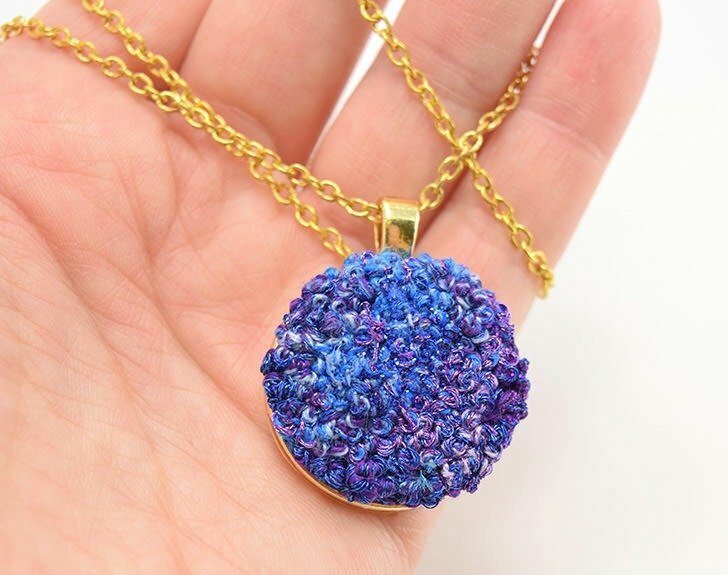 But in all of that junk I found some of my packed boxes from my craft room in Oklahoma and I started to go through them because, you know, that was totally an efficient way of handling my garage cleaning time :) I wound up finding all of these nifty ideas I found that I just LOVED and this French Knot faux druzy was among them. Huzzah for cleaning leading to something good besides just a clean whatever! Woot! 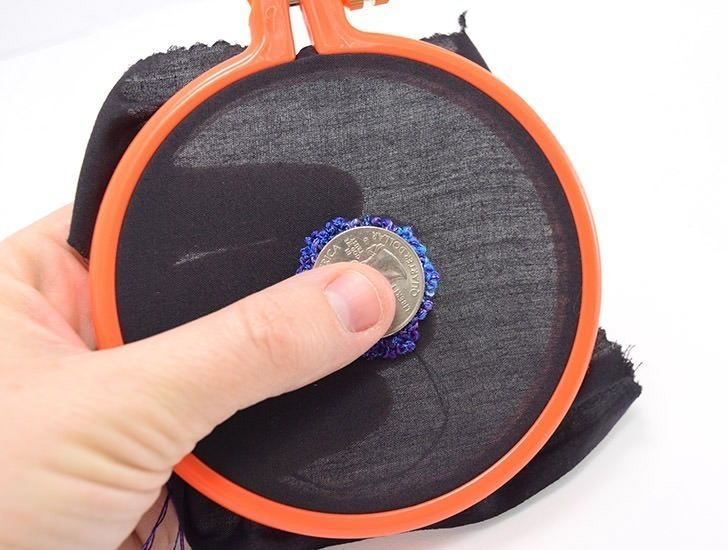 Hoop up your fabric and trace a quarter in the center of the hoop. I used black scrap fabric but use whatever you have on hand. 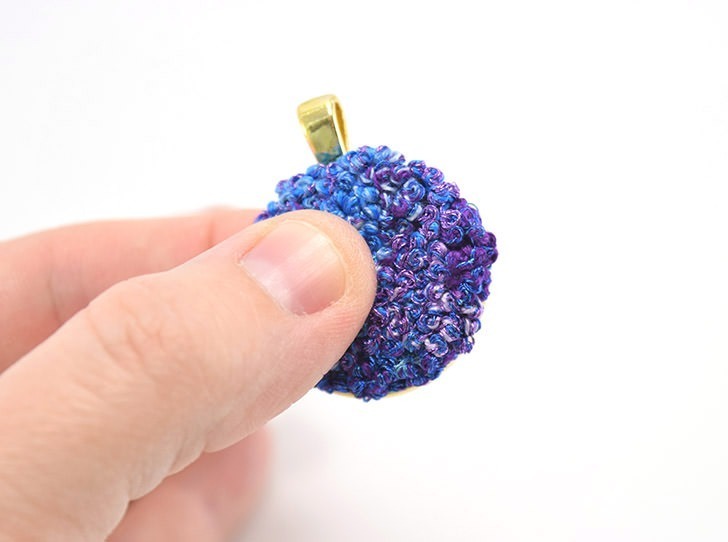 Then you just French knot that business extending just slightly over the drawn edge you created. 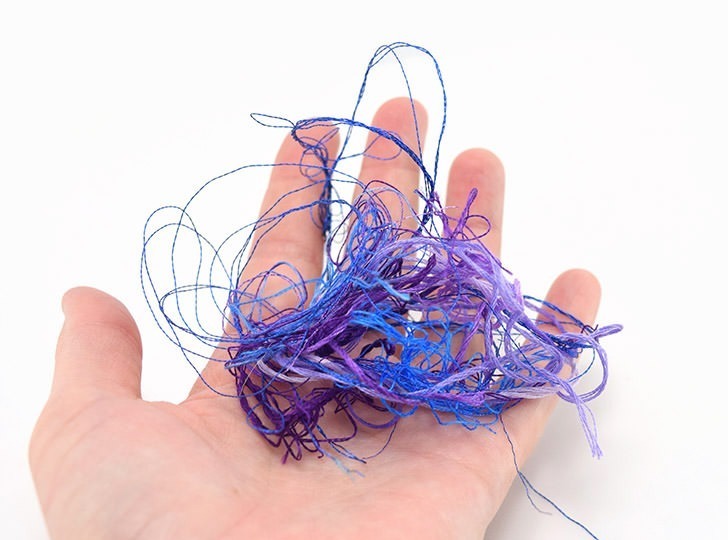 Now to get the interesting, varying colors grab a whole mess of embroidery floss in similar colors. 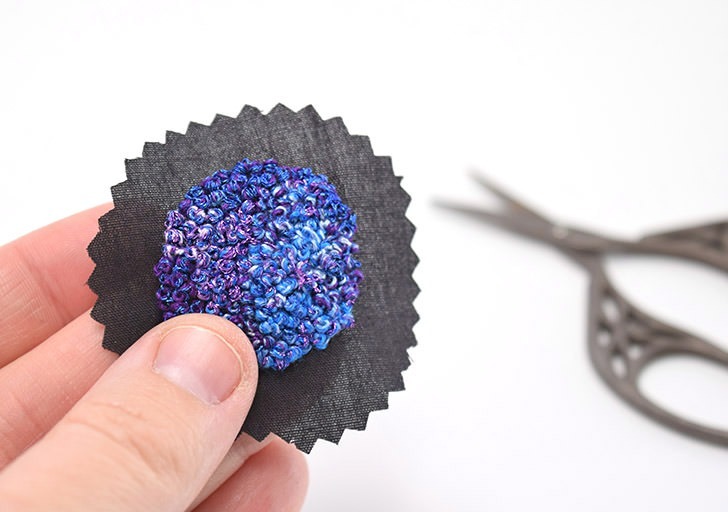 Since I went with a blue/purple theme I used purple and blue metallic floss from DMC and then just grabbed 3 different shades of blues and purples in regular DMC floss. 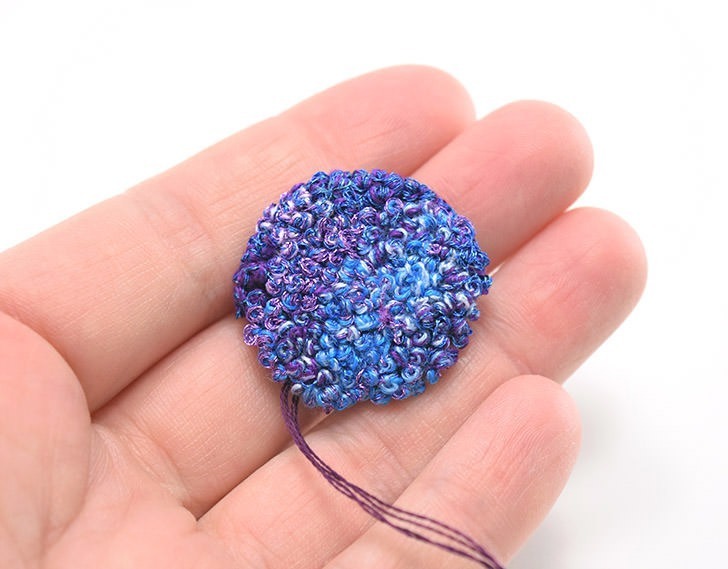 To get this great variation you’ll need to take apart your floss (each skein has 6 strands together to create the floss) and then grab 1 metallic strand and 2 strands of any of the colors you have on hand to form one piece of floss to embroider with. 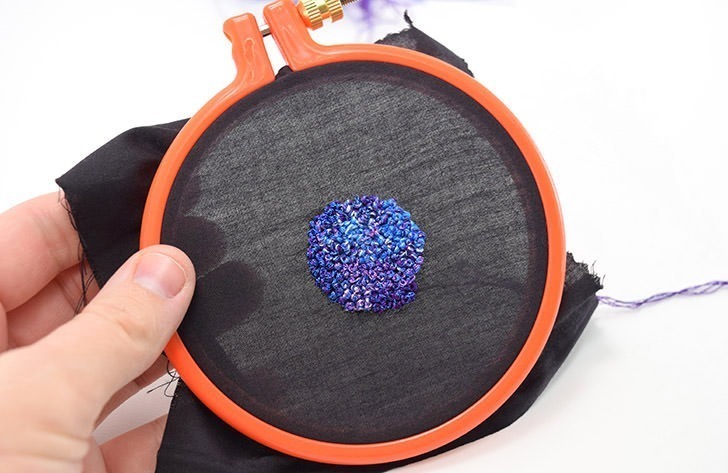 Trim your French knots to have 1/4-1/2 inch all around. 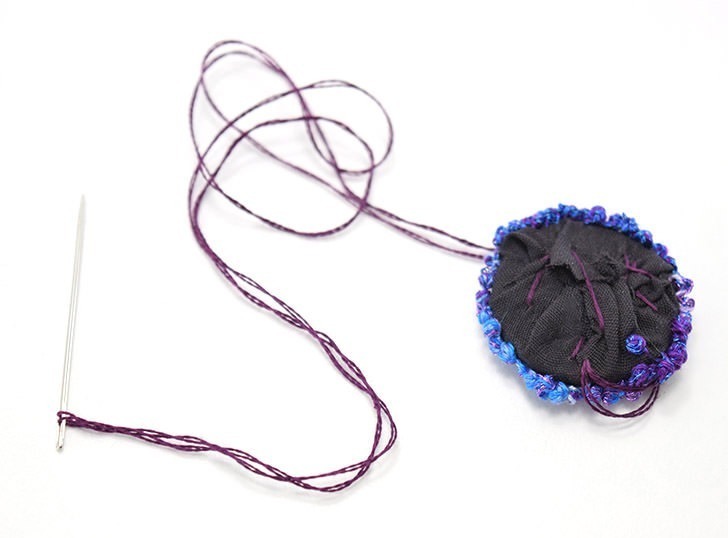 Stitch your knotted fabric onto the quarter like you see above. You can also cut out a piece of chip board or whatever but a quarter is already the right size and it only costs 25 cents. Kapow! Make sure that the edges of the quarter are covered in knots. You might kind of have to pull and tug and whatnot to get this to work out. If your shape got crazy you might have one or two that kind of go to the back but we’re gonna squish them so no worries. 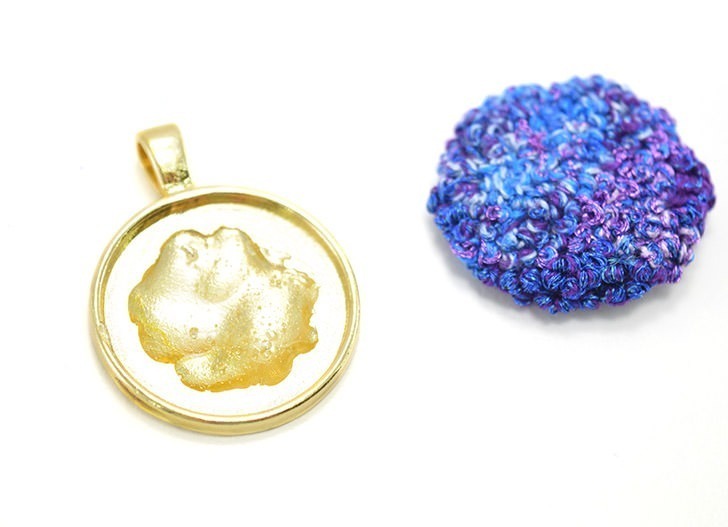 Trim up your string and let’s turn this “druzy” into a necklace! 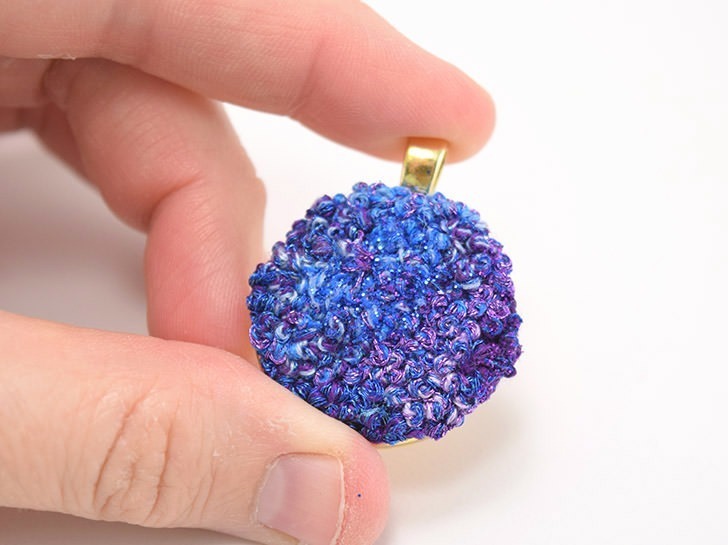 Apply a small but healthy amount of super strenght glue (I’m using Aleene’s The Ultimate) inside the bezel of the round pendant. 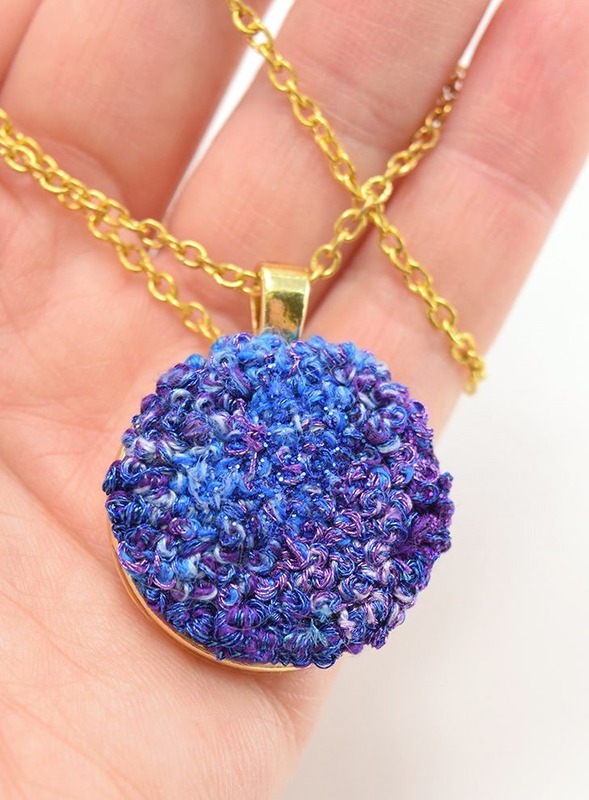 Push the embroidery covered coin into the bezel and twist until you’re happy with how the colors appear. Use a clip or clamp or other pinching type of thing to hold the 2 pieces together. Allow several hours to dry and cure, 24-48 hours is best. 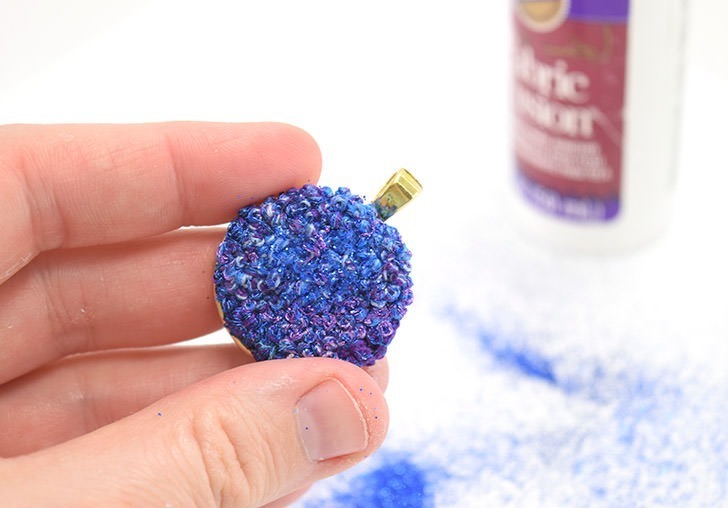 To add glitter just grab some fabric glue and squeeze a small dot here and there and then rub in between knots. I used Aleene’s Fabric Fusion. 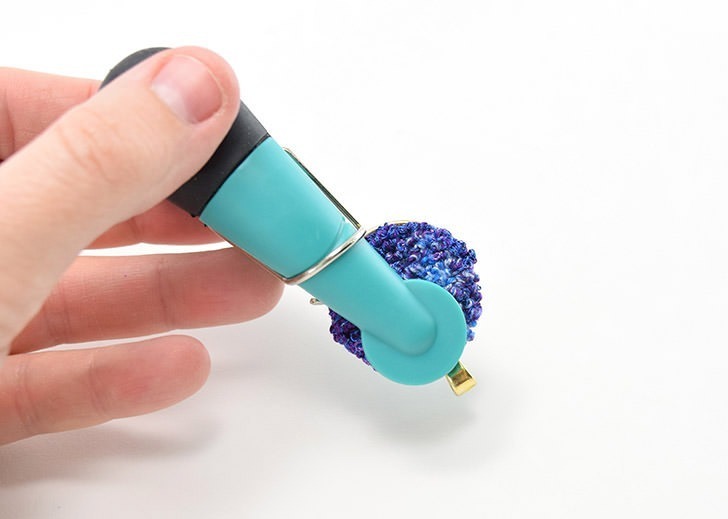 Sprinkle quickly with your glitter working with the colors of the knots. For mine I did blue glitter in the center and purple around the bottom right edge. 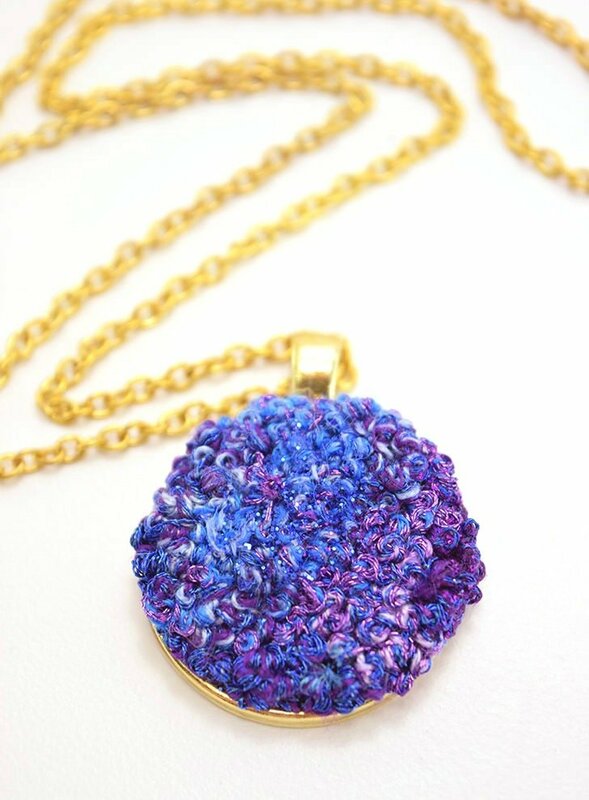 Once sufficiently dry string your pendant onto your choice of chain necklace and enjoy! Such a super cute idea! So glad you found that notebook and the idea. Thanks so much for spreading the inspiration!